SKIRMISHES have reportedly rocked Zanu PF ahead of tomorrow’s primary elections, where aspiring candidates dumped the party rules for holding joint rallies and opted to go it alone as tension escalates. The fights came after some candidates contesting in the internal selection process reportedly dumped the party’s rule of addressing joint rallies and organised individual rallies to try to reach out to voters within the short period allowed for campaigning. Intra-party violence was reportedly experienced in Harare, Chiredzi as well as the three Mashonaland provinces, mainly in constituencies where party bigwigs will face stern challenge from new candidates. In Harare’s Epworth area, Zanu PF supporters clashed over the campaign process, resulting in the arrest of one person, who is now facing public violence charges, after he allegedly teamed up with accomplices, who are still at large, to assault fellow party members. Joseph Mahlanganise Makuyana was yesterday not asked to plead when he appeared before Harare magistrate Tilda Mazhande, who remanded him to May 29 on free bail. It is the State’s case that on Wednesday, Makuyana, in the company of his suspected accomplices who are still at large, started shouting that if their unnamed candidate was not successful, voters were going to die. They allegedly started attacking the rivals using open hands, clenched fists, booted feet and a knife. The victims sustained various injuries including nose bleeding, cuts and shaking teeth. Ropafadzo Botsh appeared for the State. Reports yesterday said candidates were employing dirty tactics that included mobilising supporters to snub rallies addressed by opponents. In Mashonaland Central province, supporters aligned to sitting Mazowe North MP Martin Dinha were accused of sabotaging a meeting of his rivals which was supposed to take place at Mvurwi community hall. Aspiring candidates were left disappointed when they found the Mvurwi community hall locked with no people in sight. The supporters also accused Dinha’s allies of disrupting rallies to be jointly addressed by candidates. Efforts to get a comment from Dinha were fruitless yesterday, as he was repeatedly said to be in a meeting. In Mashonaland West, contestants were reportedly summoned to Harare after violence erupted at rallies, with similar cases being reported in Chiredzi. Many cases of candidates being booed for their perceived association with the vilified G40 faction were also reported. 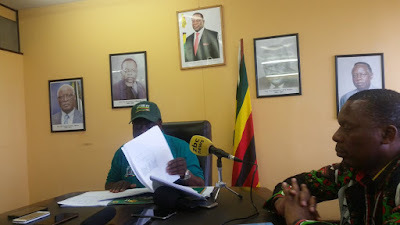 In Masvingo, the party has been battling to contain rebellion from candidates barred from contesting in the primaries, who have been besieging party offices in the provincial capital demanding reasons for their disqualification. Tensions were also reported in Chiredzi, where candidates reportedly attacked each other at joint rallies, resulting in the police being called in. There were also allegations of vote-buying across provinces, as tensions continued to escalate, with the poll date drawing near. A video went viral in which Midlands Provincial Affairs minister Owen Ncube appeared to be dishing out money at a rally, while several other candidates were alleged to have been doing the same in other areas. Midlands provincial chairman Daniel Mackenzie Ncube confirmed candidates were addressing individual rallies, but said there was nothing wrong with that, as the use of joint rallies was only a proposal. “All is set for the elections in the province. We had a meeting today in Harare to do with deployments and all is well,” Ncube said. On the issue of dishing out money at a rally, Ncube said the matter would have to be investigated. In Mashonaland East province, candidates reportedly organised individual rallies, but would still welcome rivals if they also wanted to address the voters. Some candidates were also crying foul over the party’s election rules and regulations, which they argued favoured some candidates ahead of others in the preparations of the internal polls. The candidates claimed the new regulations favoured sitting MPs as well as shadow candidates who had access to voters, while others were barred from campaigning. Party political commissar Engelbert Rugeje published the list of candidates cleared to contest in various constituencies in the internal polls last week and aspiring candidates have since then been crisscrossing the country campaigning under strict conditions. Apart from the set rules, candidates were crying foul over the short period allowed to campaign.